Australians have fallen in love with larger, sporty family cars over the last decade. The overall improvements to appearance across all larger family vehicle categories, larger family cars are now designed with stylish exterior looks in mind. Sleek looks, along with manufacturing and design improvements has turned the “petrol guzzlers” of yesteryear into fuel efficient and economical drives. 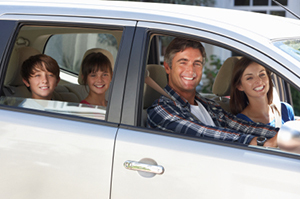 Family Cars Australia aims to bring you all the latest reviews, news and advice on the best family cars in Australia. Station Wagons: The humble station wagon has morphed into a category stuffed with sporty and spacious designs. The Hyundai i30, VW Passat Wagon, Holden Commodore wagon and Ford Mondeo are leaders in the category. 7 Seater Cars: If you have space in mind but are keen to steer clear of a “bus-like” vehicle, then models that are designed to seat seven individuals are a great option. Popular vehicles in this category include the Toyota Kluger, Hyundai Santa Fe, Ford Explorer, BMW X5 and Audi Q7. 7 Seater SUVs: SUVs are one of the hottest segments of the Australia automotive industry and among the top-sellers and most highly-recommended models are the Mazda CX-9, Toyota Prado and Kia Sorento. Small & Compact SUVs: Those families keen on the look of an SUV but without the size and price associated with larger models are keenly researching models such as the Toyota Rav 4, Nissan X-Trail, Subaru Forester and Kia Sportage. 5 Seater Dual Cabs: If you’re looking to buy the best family Dual Cab in Australia, you will have to shop around. We help review a range of Dual Cab Utes so you can buy a vehicle that gives you value for your money and includes indispensable safety features that will provide you and your family with great comfort while traveling. 8 Seater Cars: Families with 4 children are drawn to the larger eight seater models given the necessity for the additional seating they afford over seven seaters. The Kia Grand Carnival, Mercedes Benz Viano and Volkswagen Transporter Shuttle are top models. People Movers: Similarly matched to their 8 seater cousins, the Honda Odyssey, Toyota Prius V, Hyundai iMax and Toyota Tarago lead the category. Small Cars: Sometimes, whilst it makes sense to purchase a larger car for whole-family transportation, it makes more financial sense to have a smaller car for general driving. These cars are easier to navigate in busy traffic, much simpler to park in city streets and also consume less fuel. Many Australian families have one larger vehicle and one smaller vehicle. The individual that does the majority of the driving with children is the person that primarily drives the large car, whilst the other person takes the small car more often than not.